Carpets take the brunt of liquid spills and fallen foods, tracked-in dirt and snow, and other unknown substances that fall upon them. Bacteria and debris scatter through the fibers and make a happy home in our floors. Gross, right? The weekly chore of vacuuming your home picks up the top layer of dust and debris, but it is no contender for the stains and deep-down invisible carpet dwellers lurking within. Eventually, we all turn to carpet cleaners. But not all carpet cleaners are created equally. Consider the pros and cons when deciding between a DIY carpet cleaning job or hiring the pros. Pros: Personal carpet cleaners are great for small areas and serve as a quick-fix for removing stains. They are also a convenient method for removing odors. Having a dinner party next weekend and concerned your carpet looks worn and dirty? Pull out the carpet cleaner for a once-over. Cons: Unfortunately, removing stains and odors with DIY carpet cleaners is likely only a temporary solution. These carpet cleaners are limited in the depth they are capable of reaching, so the red wine that seeped to the bottom will likely rise back to the top of the carpet fibers over time. Likewise, odors thought to be removed might have been only partially eliminated. Since DIY carpet cleaners don’t penetrate through the depth of the fibers, the deep clean isn’t deep enough to remove all that’s hiding in your carpets. Another disadvantage of using DIY carpet cleaners is that you do not have a professional ensuring proper cleaning techniques. The type of carpet cleaning solution and potency level is an important factor in achieving a proper clean. And the amount of water can vary between not using enough to rinse the chemicals out and using too much so that mold and mildew begin to grow during its drying stage. Pros: Experts take control over the carpet cleaning process, using high-powered equipment, measured solutions and proper amounts of water to execute a professional carpet cleaning process. Corners aren’t missed and furniture is removed from the room to make sure each inch has been cleansed. The high-powered cleaning equipment is capable of reaching the full depth of the carpet fibers and penetrates through, cleaning each strand of its debris and bacteria. Best of all, you don’t have to lift a finger during the process. The deep-cleaning service is recommended every 12 to 18 months, by The Carpet and Rug Institute. Cons: Professional carpet cleaning is pricier than the DIY method. It is also a service that needs to be scheduled and planned for, taking more time out of your day than you might prefer. Furniture needs to be moved for the job to be done, and time allowed for the carpets to dry properly. Bottom line, DIY carpet cleaning jobs are great for tackling smaller stains and touch-ups like before (and after) having company over for a dinner party. But professional carpet cleaning should be scheduled into your annual spring cleaning checklist in order to cleanse those carpet fibers from top to bottom. 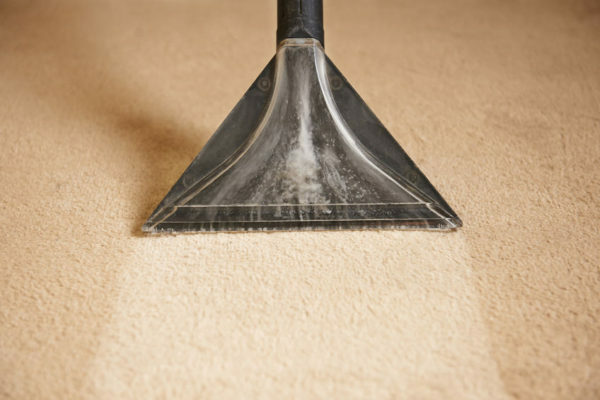 For more information about carpet cleaning services, contact Lund’s Carpet Cleaning.